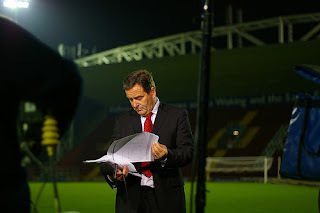 Gilette Soccer Saturday anchorman Jeff Stelling chose to wear a plain red silk tie to host the show today. Only one Premier League encounter kicked off at 3pm, but it is FA Cup 1st Round day and Stelling opted for seasonal red as his tie colour for the occasion. Plain red ties are always a popular Christmas gift as gift buyers want to give a present in the festive spirit, without opting for a novelty tie.